Post subject: Let's Talk 3: Bikes and Trikes! When Squats were first developed for 40k the range was rather limted. They had a few infantry types, a exo-armour or two and some heavy weapons. What they did have in abundance is bikes and trikes. Not for no reason are the Squats described as "Half Pint Hells Angels in Space" on this very forum. It is also refreshing to come across a unit in the Squat list that is both A) Useful in their role and B) Fairly uncontroversial for their inclusion. The biker formation is a popular, effective choice and not too dissimilar to other race's bikes. As expected, the Space Marines are better than the Squat version, with +1 to every stat. The Squat bikes are still pretty respectable in engagements and useful for moving around at 30cm capturing and contesting objectives. If there was one thing that was universally called for in the feedback on the 1.50 list it was to increase the movement characteristic of all the Squat bike units to 35cm. Who am i to deny the fans what they want? This is less of a change I want to see because of rules balance, but more because it is just so maddening to see the one race that is defined most by their love of bikes have slower bikes than all other races. The 'Attack Bike' version of the squat bikers lot. Reduced CC value but picks up the standard 15cm Multimelta. The squats don't get many MW outside of the DoomsDay cannon, so this might be useful. Probably not as pure shooting, but as a Fire Fight Engagement it's great. As a Light Vehicle, it provides some cover for the Guildmaster if you take one. Actually better than the SM Attack bike as it includes the MW attack. All other stats are worse. Again, the increase to 35cm is likely here. 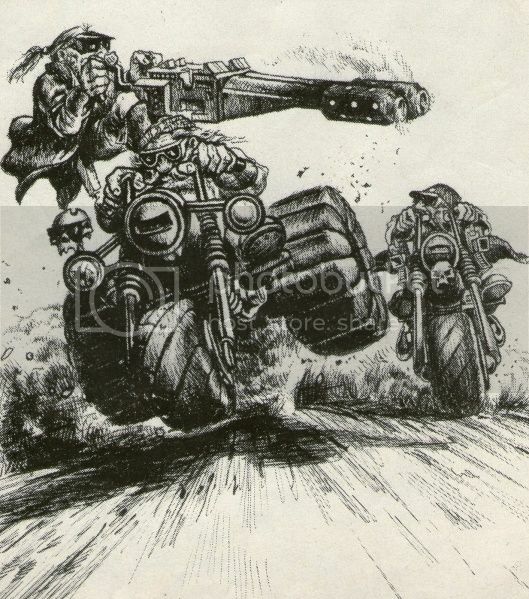 In the Rogue Trader rules it could swap out the Multi Melta for other heavy weapons, including Lascannons, Plasma Cannons, even some of the weirder weapons like Conversion beamers and D-cannons. Back when all races had access to the same weapons. It could also be armoured with an Ork Power Field. The 'Hearthguard' version of the squat bikers lot. A little bit different than a Hearthguard unit as it picks up First Strike and Invulnerable Save. It has a tiny bit more of a CC punch even though it is strangely only 5+ CC. It is a bit tougher with a $+ save and the Invulnerable Save, as I guess it attempting to model a Exo-Armoured Squat on a bike. Although strangely it has the Mounted ability despite it being a Light Vehicle. I am guessing that is a typo from when it used to be a Infantry model? Should I delete the mounted ability (leaving it needing to hide in Trikes) or change it to INF (leaving it to hide in bikes)? 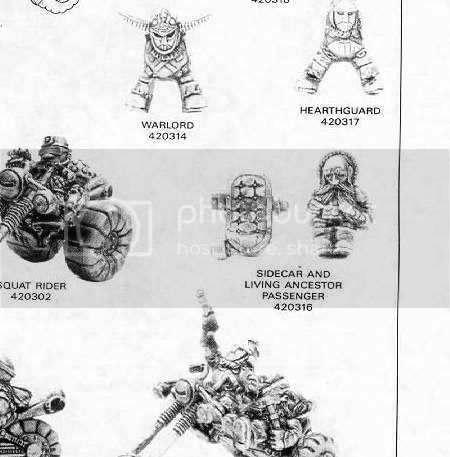 It may seem strange that Exo Armour equipped dudes could also ride bikes, but in Rogue Trader days even a Space Marine Terminator could ride a bike. There were....issues... with the rules sometimes. I'm not sure if this a conversion or a legit model. Hey Elsaurio, 100% behind upping the movement by 5cm acrid the board. Yes, happy with this. Rug has some ideas on maxing out on Bikes so I would be interested to hear his thoughts. 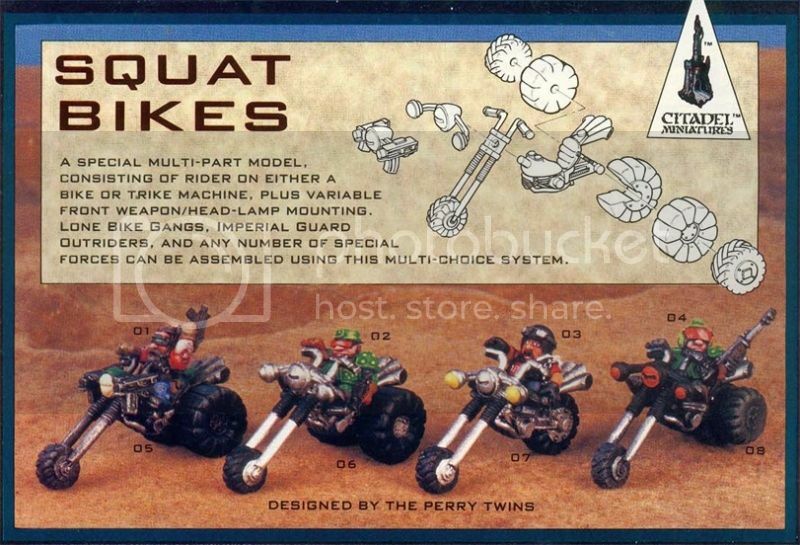 Aside from the 30cm move, I think the Squat Bikes are spot-on stat-wise when comparing them to Ork or Marine bikes. 35cm move makes sense to me. i have earlier questioned why the formation rules put a cap on the number of trikes. Why not allow us to make a formation with all trikes? But maybe this is coupled to the fact that I think the force organization is too strict as is. Why would squats copy the IG. They have their own style and I would think they have a more conscripts or eldar guardian style armies than a standing IG type army (or even Orks, yes Orks, read my "sqork" post from about a year ago for details on my crazy idea for squats). My theory is that this comes from not having a E40k list to take ideas from, so the only official lists to basebthe squats on are SM:TL era force org. which didn't have that much freedom. That's a good point, I didn't think to address formation size. Base 5, as the sprues were sold in sets of 5 or 10 in the past. Also, the Guildmaster doesn't need Mounted, he's already a LV. Aside from Orks/Nids, Epic Armageddon prescribes formation size as a balancing mechanism. This should be kept in mind. Bikes/Trikes look good to me and the +5cm is a no brainer change. I agree with Onyx*: the current bike formation is a nicely useful size and a balanced formation. I won't go messing with the make up. 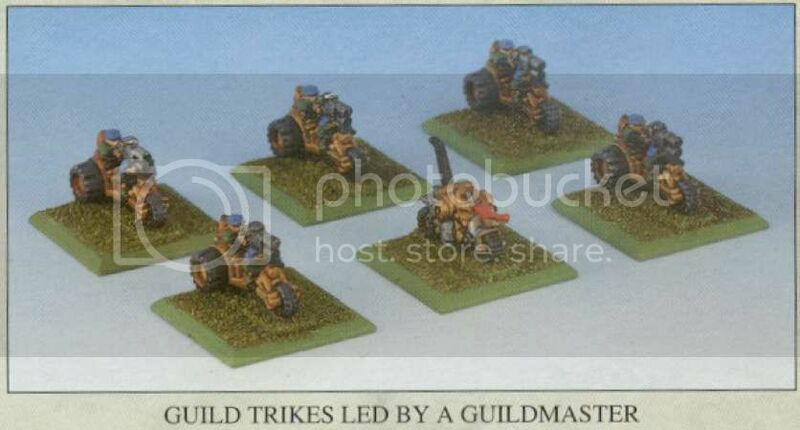 Plus I think what you get in the box is just enough models to make 3 bikes, 1 Guildmaster, 3 trikes. There has a been a lot of calls over the years for a Sub-list just about fast moving bikers. This would be the place to have a flexible biker squad. Anyone care to make one up? I agree on the +5 movement. 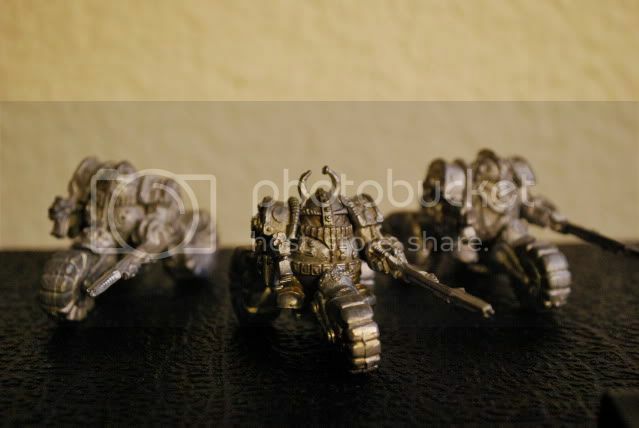 They are better than 8 ork war bikes so 225pts is about right. One of my favourite units, no change needed.